The short answer is not easily, and the longer answer is it could be an effective way to trap criminals in space, joked veteran cosmonaut Maxim Suraev in a press conference today (March 18) for the upcoming Expedition 40/41 mission, which also includes rookies Alex Gerst and Reid Wiseman. 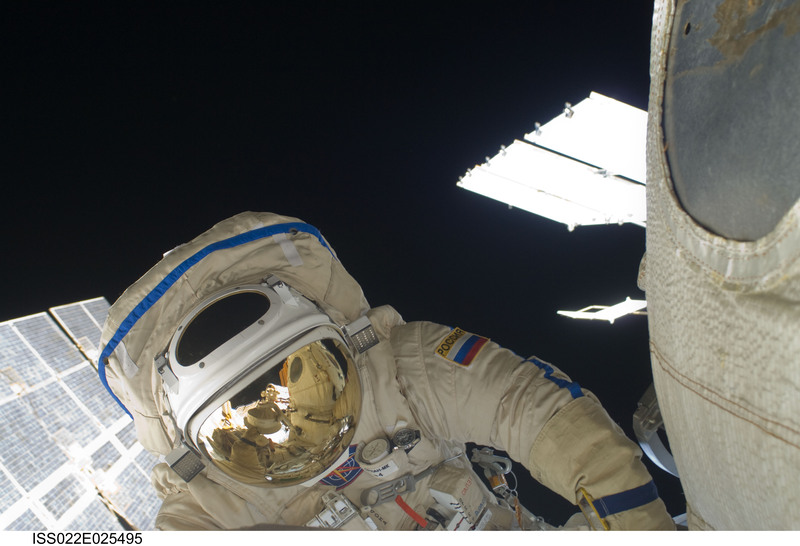 Speaking in Russian, Suraev explained that during his last 2010 mission, he had crew members set him up in the middle of the station’s Node 3. “It is true that you can twist as much as a contortionist, but you won’t be able to move because you have nothing to bear against,” he said in remarks translated into English. That said, the ventilation system on station does tend to push objects (and people) towards the vents after a time, he observed. What if you had multiple vents set up, however? The crew (who lifts off in May) will have an action-packed mission. It will include the arrival of the last Automated Transfer Vehicle (ATV) and — if NASA fixes on a spacesuit leak allow — two American maintenance spacewalks. There also are 162 experiments to perform (this according to Gerst) and if there’s time, checking out our home planet. “Earth observation was not one of the primary goals that [station] was designed for,” he cautioned in a phone interview, but he added that one of its strengths is there are people on board the orbiting laboratory that can fill in the gaps for other missions. Gerst (who was a volcano researcher before becoming an astronaut) pointed out that if a volcano erupts, a typical Earth satellite would look straight down at it. Astronauts can swing around in the Cupola and get different views quickly, which could allow scientists to measure things such as the volcano plume height. Another example of flexibility: The Expedition 39 crew right now is (news reports say) helping out with the search for the missing Malaysian Airline Flight 370. “We’re really good at capturing things quickly and then sending the pictures down to the ground,” Gerst said. Wiseman, as one of the rookies on mission, says he is interested in comparing the experience to his multi-month Navy missions at sea. It’s all a matter of mindset, he said in a phone interview. He once was assigned to a naval voyage that was expected to be at sea for six months. Then they were instructed it would be 10 months, leading to fistfights and other problems on board, he recalled. Astronauts for the forthcoming one-year mission to station, he pointed out, will launch with different expectations than someone expecting about a six-month stay. “If you know you’re up there for one year, you’re going to pace yourself for one year,” he said. But there still will be sacrifices, as Wiseman has two daughters (five years old and eight years old). He’s asking the older child to do a bit of social media, and the younger one to draw pictures that could be included in the “care packages” astronauts receive from Earth. “It’s going to be tough not to see them on a daily basis. They grow so fast,” he said. Other things to watch for on this mission include the arrival of the station’s first 3-D printer, setup of an alloy furnace to make new materials in microgravity, and a potential Wiseman-led “come out and wave campaign” that would encourage families to go outside and tweet about the space station as they watch it. You can follow Expedition 40/41’s continuing adventures at Universe Today as well as on social media: @astro_reid for Wiseman, and for Gerst, @astro_alex or his Facebook page. My first reaction (see what I did there) was “well, just put your lips together & blow” but yeah, the fan idea would be able to counteract that fairly easily. Add in a visual sensor and some microprocessors to automate the whole thing & it would keep the subject bobbing around pretty much indefinitely.